In our previous tutorial, we used a simple array to store the data elements, but in this tutorial we will be using Stack data structure for storing the data. While implementing a queue data structure using stacks, we will have to consider the natural behaviour of stack too, which is First in Last Out. For performing enqueue we require only one stack as we can directly push data onto the stack, but to perform dequeue we will require two Stacks, because we need to follow queue's FIFO property and if we directly pop any data element out of Stack, it will follow LIFO approach(Last in First Out). In all we will require two Stacks to implement a queue, we will call them S1 and S2. In the code above, we have simply defined a class Queue, with two variables S1 and S2 of type Stack. We know that, Stack is a data structure, in which data can be added using push() method and data can be removed using pop() method. You can find the code for Stack class in the Stack data structure tutorial. NOTE: First stack(S1) is the main stack being used to store the data, while the second stack(S2) is to assist and store data temporarily during various operations. If the queue is empty(means S1 is empty), directly push the first element onto the stack S1. If the queue is not empty, move all the elements present in the first stack(S1) to the second stack(S2), one by one. Then add the new element to the first stack, then move back all the elements from the second stack back to the first stack. Doing so will always maintain the right order of the elements in the stack, with the 1st data element staying always at the top, with 2nd data element right below it and the new data element will be added to the bottom. This makes removing an element from the queue very simple, all we have to do is call the pop() method for stack S1. In this approach, we insert a new element onto the stack S1 simply by calling the push() function, but doing so will will push our first element towards the bottom of the stack, as we insert more elements to the stack. But we want the first element to be removed first. Hence in the dequeue operation, we will have to use the second stack S2. If the queue is empty(means S1 is empty), then we return an error message saying, the queue is empty. If the queue is not empty, move all the elements present in the first stack(S1) to the second stack(S2), one by one. Then remove the element at the top from the second stack, and then move back all the elements from the second stack to the first stack. 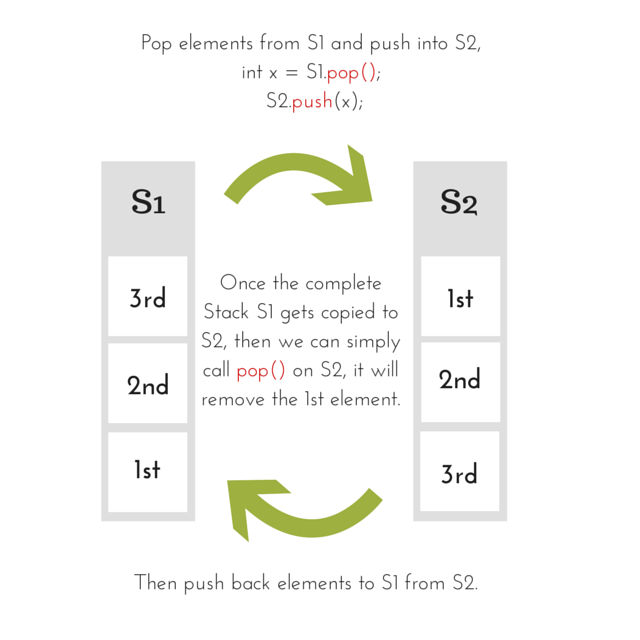 The purpose of moving all the elements present in the first stack to the second stack is to reverse the order of the elements, because of which the first element inserted into the queue, is positioned at the top of the second stack, and all we have to do is call the pop() function on the second stack to remove the element. NOTE: We will be implementing the second approach, where we will make the dequeue() method costly. That's it, new data element is enqueued and stored in our queue. When we say remove data from Queue, it always means taking out the element which was inserted first into the queue, then second and so on, as we have to follow the FIFO approach. But if we simply perform S1.pop() in our dequeue method, then it will remove the Last element inserted into the queue first. So what to do now? As you can see in the diagram above, we will move all the elements present in the first stack to the second stack, and then remove the top element, after that we will move back the elements to the first stack. Now that we know the implementation of enqueue() and dequeue() operations, let's write a complete program to implement a queue using stacks. We will not follow the traditional approach of using pointers, instead we will define proper classes, just like we did in the Stack tutorial. And that's it, we did it.